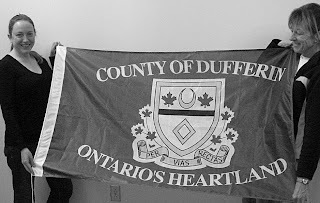 An article last week in the Orangeville Citizen of Dufferin County, Ontario (dated February 25, 2010), gives a bit of the history of Dufferin County's flag, and of the coat of arms which is so prominent upon it. One thing that they didn't note in the article is exactly what the arms of the Earl of Dufferin either looked like or were blazoned. So, naturally, I went hunting. In Burke's General Armory, the arms of Blackwood, Earl of Dufferin, are given (in the first quarter of a quarterly coat) as: Azure, a fess or, in chief a crescent argent between two mullets or, and in base a mascle argent. [I try to avoid the difficulties inherent in the old English blazons of not repeating a tincture but forcing the reader to count tinctures back from the beginning of the blazon by describing repetitions as "of the first", "of the second", "of the third", or "of the field". It can be confusing, and sometimes leads to some pretty obvious errors when the arms are drawn from the blazon. Since not even the College of Arms in London retains this awkward system, but just goes ahead and repeats the name of the tincture where needed, I have altered the blazon from Burke's to reflect this practice.] From the description in the article, the mullets in the Earl's arms are pierced.